Alike safari jacket or camouflage pattern, tactical pants are specially inspired by military design, and closely related to cargo pants. However, to distinguish them from cargo pants, they have been produced with some different technical modifications — such as the use of hard-wearing, lightweight, and fast drying fabric and typically solid in color — so as to give greater aesthetic pleasure, but still outlast any other pair of pants you have already owned. Even though the best tactical pants advertised for sale are most suitable to those professions or works in tactical-related fields, these are a suitable item that can be worn for any occasions, thanks to online paying, you now can choose and buy whatever pants you like. And for those who are still wondering what to buy, here are 11 tactical pants available today that have the best reviews in all. For nearly a decade, the original TRU-SPEC black tactical pants are the best fitting, most comfortable tactical pants on the market. The material is 6.5-ounce polyester rip-stop, not only preventing the spread of the tear or rip on it, but also be heavy-duty enough to feel like a true-work pants. Although pretty heavy in the summertime, in the winter, they would keep you plenty warm, since some spots in them having cooling function. These have proper ventilation maintaining their comfort really well which is much important if you need a pair of pants outdoors all day long. The design was engineered dimensional fit and featured a slider waist band eliminating the need for gathering the elastic or adjustable side tabs. You can see it stretching on both sides to accommodate for your satisfaction even when you’re sitting in a vehicle. Additionally, the cargo pockets feature two internal magazine compartments, so you can drop your cellphone in really handy without rummaging through whatever items you might have in your pockets. Another cool feature is that other pockets include a knife accessory pockets behind both of the deep thread pockets. Not only do they have a useful front deep pocket but they also have the reinforced section in the back for the clip of your pocket knife, no more cutting your jeans with the pocket knife or getting that whole area scuffed up. Down to the front legs are front-facing cargo pockets with a seller magazine pocket on top reinforced so that you can actually reach your hand in and out of the pocket and grab the contents without really hitting anything else. Lastly, the reinforced knees are also designed with the insert knees pads, making sure that the tough movement can’t do harm to your knees at all, as well as endure the intense exposure without remarkable tear-outs. These tru spec tactical pants take so many boxes satisfying your needs as much as possible, making it the super winner for all kinds of outdoor activities. The next option is the Under Armour tactical pants, made of 100% Polyester, which is the comfortable lightweight breathable fabric. UA Storm technology has produced this kind of material with a water resistant treatment by using Teflon, so that if it’s raining out, you wouldn’t get too soaked. In the manufacturing process, these tactical pants have to pass through a testing device that actually sees tests water permeability from one side to the other. These are all Teflon coated for that particular purpose; furthermore, this material is also ultra-durable rip stop, which means these pants can put up with any tough rubbing for the outdoor activities. When it comes to the elastic in the waist, it is just a little stretch, but still adjustable enough to bring about the supreme flexibility and extreme comfort. The waistband is constructed from Mil-Spec nylon BT 295 used a lot in making military parachutes and heavy-duty stuff. The other noticeable feature is its pockets have very deep side, incredibly deep, in fact, a small notebook can actually fit very snugly and comfortably in the Under Armor pants. Moreover, these pants also have both cavernous deep front pockets and secure cargo pockets with internal magazine pockets, and that’s a really good thing. Utilizing a very lightweight Teflon treatment, these pockets can contain any kinds of knife, or sharp tools without making the fabric tear or rip away. More conveniently, the design includes offset belt loops as well, really suitable to anyone always being forgetful, or having inseparable things. The crotch along with the knees of the pants are reinforced pretty reliable, so as to endure any tense friction in case you need to involve in a field battle. Not only that, but also these are equipped with anti-odor function, preventing the reproduction of odor-causing microbes. Thanks to its versatility, I think this Amour tactical pants are certainly the appropriate choice to someone who is fond of field sports. The following option that I find worth trusting is Mars Gear Vulcan TAC Outdoor Tactical Pants. Made of the Poly/Cotton rip stop materials, with twelve strategically placed pockets, they are certainly very suitable for tactical application. On the top, you can see two d-rings on both sides so that you can hang your multi-tool and easily bring along. Also, you have two side slit pockets, which are pretty convenient for such items that you want easy access to. Moving over to the front, you have two standard pockets, yet they do run nice and deep and have the angle as well, which is built for putting a flashlight, knife or something like that, definitely a plus. What’s more, inside the front ones, these’ve also got another smaller pockets that are about three or four inches deep, with a pretty cool Mars gear logo on the right one. Near the knees are the side cargo pockets with hook and loop flaps, up nice and high, so while you’re standing normally, you can reach and get into them without having to bend over and lift your leg up. Behind, the back pockets have hoops and loops on both of those, very basic and easy to access, nothing super fancy about them but they certainly get the job done. Down at the bottom, you have the tie offs hidden inside, and I generally recommend that you should put one or two loops in them to keep them from dragging on the ground when you’re walking around. To summarize, they are comfortable, and when get damp or moist, they’re about to dry out quickly just because they’re lightweight material. 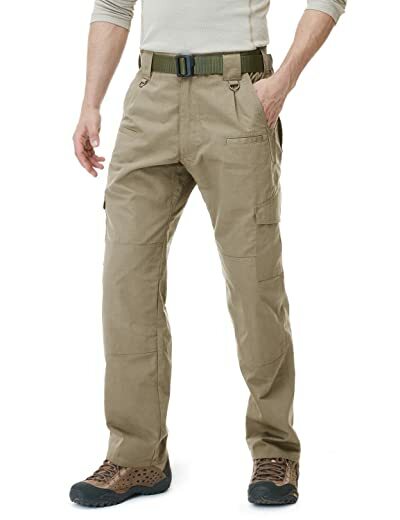 If you like wearing pants that have lots of pockets, or options built into the pants, you should purchase these Mars gear Vulcan tactical pants, whether in khaki or in black, these are still relevant not only due to its good functions, but also owing to the reasonable price. The next noteworthy option is from LA Police Gear, sort of your typical tactical pants. Constructed of 65% Polyester/35% Cotton Rip-Stop Fabric, these pants additionally have a high strength YKK Zipper with a brass tac-stud, both of which are strong and durable enough for long-term use. Same with the other pants, the slash pockets get a lot of the key areas reinforced, so they won’t wear out when you bring along multi-tools, or sharp things. These pants not only have the knees reinforced with the foam knee pads, but also have the crotch part gusseted, making it more protective in the field. Mentioning the strategically placement pockets, the two front have the pass-through on top just like the other pants; meanwhile, two back pockets have button closures. As you wish, these pockets are big enough to fit whatever you put in. And in some ways that’s pretty cool, because with the other pants, you need to have very specific gear to fit in those little pockets. However, the coolest feature of these pants is the elastic waistband on steroids, which is much larger and stronger compared to the others. That’s really nice, because if you don’t wear a belt, the pants will still cling to you better. Plus, at the bottom of each leg are the built-in blousing strings, helping it much more convenient in moving. In addition, these pants are sold with a variety of colors such as Navy, Olive, Drab, Khaki, Pile, Brown, etc. and so you can choose whatever color with the same price. They still cleaned pretty nicely if they get dirty, and they have lots of pocket space which you would like if you have to carry a lot of gear all the time. They’re a lot cheaper than many of the other operator pants or tactical style pants on the market, but you still have enough quality to use this stuff without it getting totally destroyed. 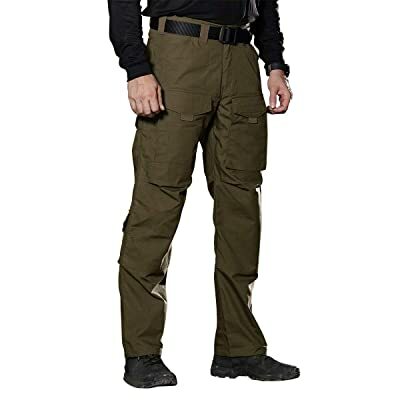 Therefore, if you’re looking for good tactical pants with knee pads and you don’t want to break the bank, this LA operator pants with elastic waistband have been definitely a good way to go so far. Next, I’d like to introduce you a product from Propper brand. 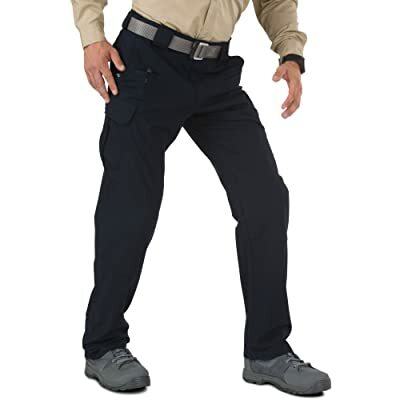 These propper tactical pants are a lightweight tactical trouser that is being marketed toward law enforcement contractors. These are manufactured from a durable polyester cotton rip stop material with a variety of colors including Charcoal, Black, Range, Gray, Flag etc. up to 16 colors that would make you delighted. Firstly, you have a smaller pocket inside the right pocket, sometimes considered the coin pocket, for containing such small items as a spare key, or a tiny flashlight. Meanwhile, you have the left front pocket reinforced, which is wide and deep to contain large-size tools, along with an extra lip where the battery clip can be hung without getting any tearing or fraying. Owning one of these, you would get your standard cargo pockets and their Velcro on either sides, along with a small cellphone pouch on the left side. Talking about the belt loops, particularly they’re a little bit bigger than the standard loops, so they’re tall or wide enough to put tactical belts through, supplementing a convenient d-ring for keys on the right front loop. On the back side, the pockets are highly entrenched, typically they go down for five to six inches, down all the way to the reinforcing panels for the rear. Another feature to note with these is the elastic band on the sides, though this whole band is not elastic; in the back it’s your standard cuff, whereas the sides are elastic, so if you do conceal, it’s going to give you a little bit of play. The other thing with the Proper pants is their knees are both reinforced, which would give you excellent coverage. What’s more, there is 65% polyester in the material, so these pants are going to be a little warmer in the fall or winter. In the end, thanks to its multi-purpose pockets and pockets inside of pockets, plus many great features, I think this would be perfect in any cases. Next helpful selection is the Urban tactical pants, not super cheap, but they are nice pants if you want a little different style pants with at least 10 separate colors that you can mix and match. These are made from 60% cotton 30% polyester 3% spandex; alike the uniform pants, they have much functionality, and looking a bit more modest. Starting up at the waist, these Helikon slim fit tactical pants have a piece of elastic tucked in, right in the rear, about six inches plus two inches of stretch. In the front, there are two small pieces of fabric that you can hook a carabiner, or whatever you want to clip on. Furthermore, they have a locking brass YKK zipper with a nice large zipper pull. On the inside, there’re some internal pockets that can be useful for different things if you want to stick either a baton, a kubaton, or a magazine. Outwardly, you have two front depth-wide pockets that are all symmetrical and have a curve designed. These are all reinforced at the edge, so if you’re about to slip a knife or a flashlight, it still provides better wear long term for that. A little bit lower, these have two hook-and-loop closure pockets angled on both sides, perfect for your cellphone, as it can fit exactly in this pocket. Moving down, the knees are both articulated with the knee pads, given a little bit extra reinforcement, allowing for a little bit easier bending of the knee. Additionally, the crotch is also gusseted for a little bit extra ease of movement. At the back, two large pockets with hook-and-loop fasteners go with 2 auxiliary small pockets placed inside that are expedient for putting flashlights, knives. You may find concerned at the beginning, but honestly it’s not bad at all, many extra space freed up, rugged durability, enhanced stitching, easy in moving. They’re actually very flexible to fit in, so if you are after something a bit different style of technic, this Helikon urban tactical pant would convince you with its plenty of options. Next stuff, I want to suggest you the CQR Men’s Tactical Pants Lightweight EDC Assault Cargo, TLP105 and TLP104. First of all, the material is water resistant like a Teflon coated stuff, and composed of 65% polyester 35% cotton rip-stop fabric that repels water, oil, and dust. In the front, this model has two thigh pockets, along with the smaller slash pockets inside that have layered ‘V’ shaped bottom, designed for the tactical purpose, and can contain clip-on accessories seams. A little lower, there is the non-flap magazine pocket, which is convenient for quick storage of tactical equipment, tools. Down to the knees, you’ll find two side external pockets secure with Velcro flaps, offering safe storage of tactical equipment or cell phones. And these are designed with the Velcro diagonal line ACU as well, so as to prevent clothing from sliding down a speedy connection and activity. At the back, you have the Velcro flapped pockets that are light material and do shed the inside space, with deep and secure storage. In my opinion, these hatched design is adequate for easy access even when gloves are worn. Moreover, there is an elastic expansion in the waist that is specially designed for comfort and satisfaction. Plus, the snap button and zipper are really useful, as they are constructed of high-density metal alloy, something that I have only seen on far more expensive pants. The tag button is rugged for quick fastening, while the zipped is upgraded with durable mounted stopper. On top of the pants, you will also see the plated D-ring attached in the front belt loops, added with a view to providing easy hook-on installation of tactical accessories. So far I am pleased, the craftsmanship, the workmanship on the pants is a lot better and usable. You can wash it many time, but the fabric will still provide excellent durability and cool comfort without any fraying or poor seams. Actually, I’ll give it a thumb up for its versatility and durability, accommodating for various tools and equipment. 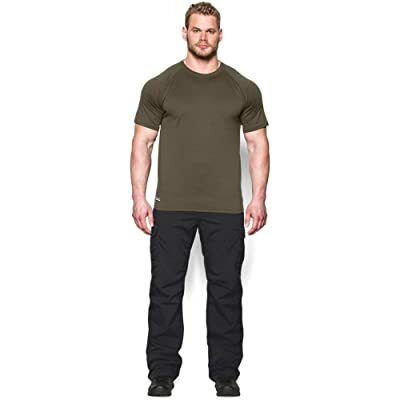 The following option is Hiking Climbing Tactical Trousers sold by FREE SOLDIER brand, these are made of DuPont Teflon fabric, a combination of 50% Nylon and 50% Cotton, stain repellent, liquid-proof, scratch-resistant, and anti-oil pollution, specially designed for outdoor enthusiasts with up to 11 functional cargo pockets. Firstly, you can easily see two front big-size pockets on top made with strengthening stitching, and the slash pockets for your multi-tools as well as foldable knives. A little lower, you have two opposite thigh pockets flapped with a well-made Velcro, and one of which is a unique concealed pocket, suitable for carrying a knife or flashlight. Right next to these two side pockets, the trademark has added EDC pockets for putting flashlights, pens, or sort of EDC items. In general, you’ve also got two back thigh pockets together with two back shank pockets on both sides, these are pretty heavy-duty and have Velcro closure, so they’re convenient and safe for carrying all the tools or parts. More conveniently, not only the knees are strengthened with extra knee pads, but also the bottom of the pants is reinforced with 3D solid tailoring line, so it’s obviously sturdy and durable enough to protect as well as effectively make the trousers flexible and firm. The other nice feature is the adjustment Velcro working as the fasteners on both sides of the waist, in order to bring about the perfect snug fit. These pants are added two plus hanging loops in the back for cliping on small items and tools. However, the most noticeable addition I found is the Molle system from webbing on the left side, mainly serving the tactical purpose. Personally, these pants wear every utility, nice and thick fabric, Molle drawstrings, perfectly fit waist, well-made tailor, practical pockets with half of them having Velcro closure, so once you put them on, you can see that they are superior quality that attach anything needed for the field. If you’re a huge fan of the tactical pants, you shouldn’t skip the following selection. 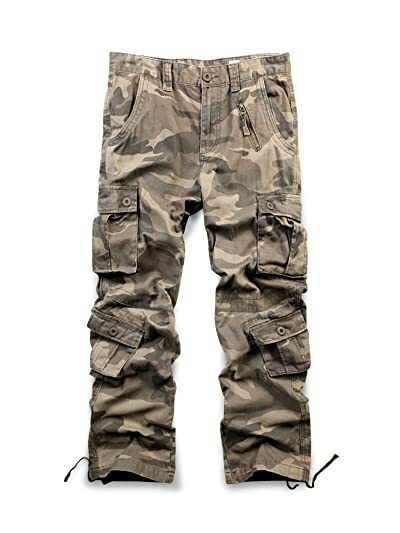 Manufactured by AKARMY seller, these solid cargo pants are completely composed of cotton material that is comfortably lightweight for outdoor activities. These tactical pants offer up to 18 kinds of colors and patterns, which would help you facilitate in making a purchase. Designed with basic functions, on top of these, you have two large and deep front pockets, which seem pretty sturdy and durable to contain all types of your handy stuff. Interestingly, you’ve got a front zipper next to the edge of the left pocket added just for decoration, but it still shows the aesthetic that the seller would want for their client. Next, these have two side cargo pockets, and two side shank pockets, all are flapped with buttons and reinforced so that these can ensure its capacity for large-size tools, or important things like your cellphone, or wallet. Plus, these’ve also got the knee parts reinforced, making sure that the user can use it under any case without having the knee part worn or torn out. In the back, these are featured with two pockets under the waist, which uses button fly closure, sturdy and seem rugged, so as to contain your necessary tackles in the long term as the main functionality. As the fabric can’t stretch at all, the seller have supplemented the adjusting tie in the waist with the strong sewn-on-seam belt loops, so that these can bring you the perfect fit for the everyday use, making these more well outfitted under any harsh environment. At the ankle, these are also added a plus drawstring for the fixable cuff. 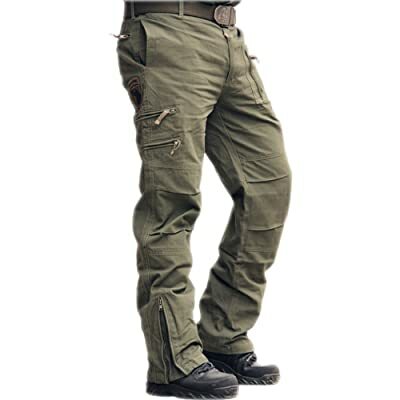 To summarize, I highly recommend this product, these tactical pants are not only true to size, but also superb quality. 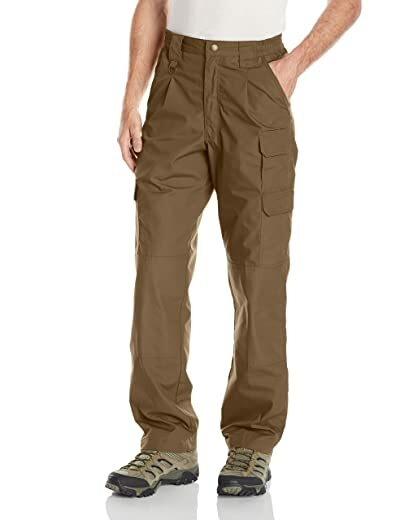 Such a nice pants for the outdoors with all the multi-purpose pockets that can withstand the elements and keep you protected in those rough environments, outlast anything you could find at a local big-box store. Another closest thing to the ‘military issue’ you will find is a design of OCHENTA brand. 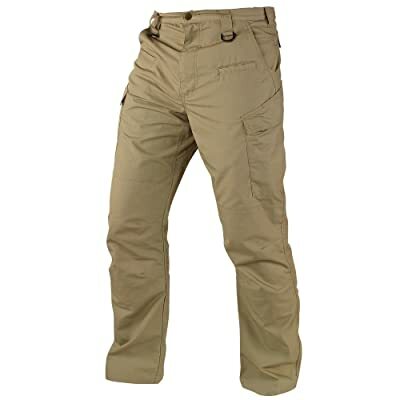 These Cargo 100% cotton pants are made of soft and rugged fabric, perhaps, you will feel a little heavier, but they are substantial, much more comfortable and flexible putting on. These are produced in a bunch of different colors and camouflage patterns for both man and woman, suitable for such outdoor sports as climbing, hiking, camping, etc. Similar to the typical tactical pants, you will find copious pockets definitely very beneficial. 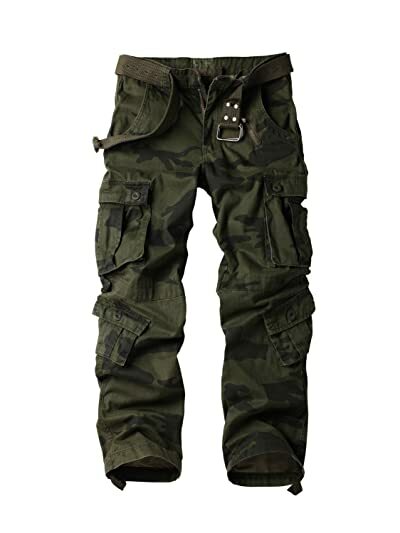 Owning two front and two back pockets, you can carry such things as in the field enforcement, but still feel comfortable while taking a seat; next to the edge of the left front pocket, the pants are also decorated with a zipper pocket, bringing about the wild look for these already tactical pants. Moving lower, you’ve got two side cargo pockets as well as the shank pockets on each side that are made really sturdy with the button closure. Obviously, these pockets have large interiors so that you can slip in your handy stuff, or such indispensable items as wallet, cellphone, etc. These pants have evenly two knees reinforced that are durable enough to endure the harsh impact. The greatest feature about this kind of pants is because they fit very nicely without being tight or restrictive. Thanks to the help of the drawstrings inside the waist and the tie-offs at the ankle, you can adjust the most suitable size for your pants. As far as I am concerned, these are perfect for the harsh environment, and most types of outdoor activities in general. Generally speaking, these are as ideal and flexible as the casual in your closet. Easy recommendation in my opinion. Classic style, perfect fit, excellent quality, nice material and craftsmanship, these are exceptional as for their distinct utilities. Last but not least, I would like to offer you Men’s 101 Airborne Cargo Pants Multi-Pockets Outdoor Sport Military Pants, an outstanding design sold by Sunsnow. Composed of 100% cotton, these are super comfortable for work, hunting, or operation stuff. There are only five colors produced consisting of Khaki, Army green, Black, Camouflage, Grey; whereas, its unique style can match with whatever you want, for any occasion you need. First of all, resembling a typical pant, these pants have two front pockets and two zipper closure back ones under the waist, which are large deep and well-tailored, beneficial for storing two large cell phones or more, maybe your important utensils. Next to the left front pocket, these are sewn with a square pocket, seem sturdy and rugged. This pocket is medium-size and has a vertical zipper that used to shed the inside. Plus, the seller has added an extra smaller floating pocket next to the zipper where you can holster small tools for convenience, such as a clasp knife, or a kubaton etc. Moving lower to the thigh, the pants are decorated with some heavy-duty zippers, one on the left side, and two left on the other side. Though this edition mainly serves for the aesthetic, you just have to admit that it truthly shows your spirit and characteristic. Also, the crotch of the pants together with the knees area is reinforced with the embroidered inseam, the seller has had a cloth sewn under these parts to strengthen these under tough impacts, an ideal design for standing, climbing, hiking, etc. Additionally, these tactical pants have also applied two vertical zippers at the bottom functioning as the adjustment for the suitable size. In my opinion, these pants have a very fitness design, with lots of multi-purpose features, perfect for your outdoor activities. You will be able to bend and knee with comfort, soft material but still tough on the outside, really durable and reliable with these heavy-duty stitching, so if you work on an assembly line, I highly recommend. When it comes to 5.11 tactical pants, the very first benefit you will get is their various colorways to choose from. Plus, full size chart to ensure you will pick the best tactical pants fitting your body as a glove. In terms of material, it’s flec-tac proprietary fabric which is arguably one of the most durable materials in tactical gear field. Take note that this pair is made out of 35% cotton and 65% polyester that’s dried very quickly as well as absorbs moisture efficiently. From that point, any movements during hot weather won’t drive you to itchiness or annoying wetness. Besides, this kind of material is very durable and lightweight with superb comfort and great performance in difficult conditions. 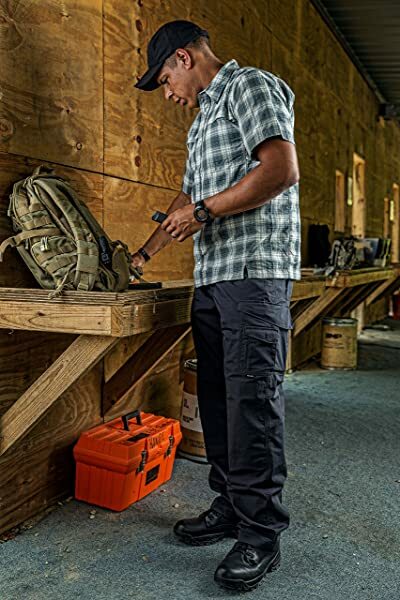 Speaking of added-in pockets, this 5.11 stryke tactical pant will shock you out with its 11 pockets consisting of YKK zippers, double-deep cargo pockets and Prym snaps. Everything is all well-made with highest grade material. One last thing to keep in mind is its stress points Flex-Tac material is mechanical stretched in 4 ways. Blackhawk Tactical pants are my next advice for those who are looking for a combination between polyester and cotton. You know that, this genius mix helps significantly to keep your dry and comfortable all the time because it takes advantage of both kinds of material’ benefits. When it comes to this realistic design, you will get 8 multipurpose pockets, each cargo models of which gets 3 AR magazine pouches. Besides, there are included knee patches to protect your body better. Take note that there are interior pockets so that you can add some more pads due to personal preference. Besides, its waistband is designed as an action model to bring you more comfort during movements. Plus, the dual belt loops on the frontside play a huge role for badges or clips and also, there’s a gusseted crotch. The best thing about these tactical pants is its water-resistant ripstop fabric with Teflon Shield. Other than that, they are easy to wash and maintain based on their breathability and quick drying ability. In conclusion, tactical pants are integral in your closet for their multi-purpose as well as durability. Whether you’re interested in outdoor activities or not, you should own at least one of these due to its advantages. These are either sturdy in extreme conditions or fashionable for your everyday use. You would be regretted for skimming this kind of pant, let’s renew your casual style with tactical pants from now on. Ah, if you are also looking for a good tactical wallet, don’t hesitate to take a peak at my latest article. Surely, you will find many interesting products there.